the style and personality of the individual it memorializes. Your monument will be carefully carved and engraved by our skilled craftsmen to reflect the personality of yourself or the loved one it memorializes. Monuments come in a variety of sizes, finishes, and designs. You may customize yours to perfectly reflect the style of the person remembered. 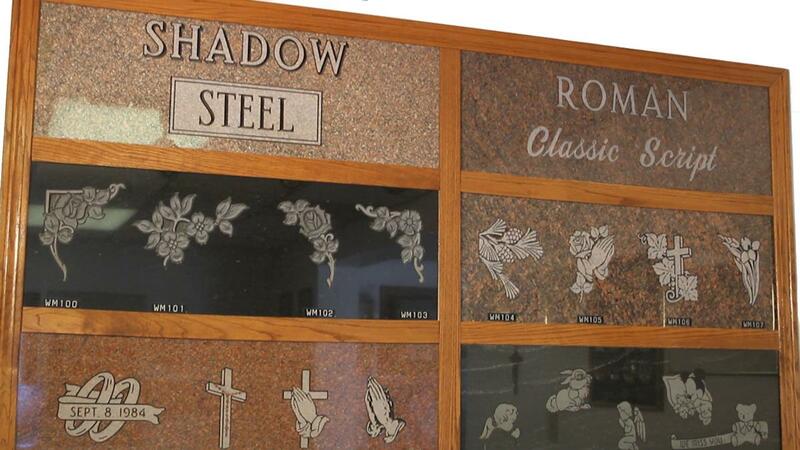 We will gladly assist you in choosing the right finish and lettering to guarantee a long-lasting memorial for you or your loved one. At Wittenbeck Memorial, we take the time to understand your situation and discuss your options. We want to make sure you’re aware of what makes a quality memorial and, most importantly, we want you to feel confident in your decision. Granite: The hardness of the granite you select determines how well it can be polished, and how well it will stand up to the elements of nature. The clarity of the granite refers to the grain structure and the clearness of color, and this will determine the quality of the finished memorial. Lettering: Lettering quality is determined by how deeply the letters are cut into the granite. More deeply cut letters mean better durability and stronger contrast and legibility. You should understand that some lettering styles work better on certain types granite, where others would not. Carving: Quality and cost can be affected by whether you choose a 2-dimensional (“flat” carving) or a 3-dimensional carving. 3-dimensional carvings are sculpted by hand and thus require greater skill and craftsmanship. Design: Whether you would like a more traditional look or a uniquely personal design, it is important that the finished artwork maintains a pleasing balance between space and design. Installation: Your monument isn’t done until it’s set in the ground, and it is very important to ensure that your monument is installed properly in the cemetery. The foundation must be substantial enough to resist tipping, and the monument itself should be straight and level. Many cemeteries also have specific rules governing the size and depth of a monument’s foundations, which much be adhered to. You also want to avoid staining by making sure the monument is sealed properly.